R. Antezana, L. Gonzalez, P. Gonzalez, P. Lopez, S. Silva, G. Folatelli, R.
Jan. 25.30 UT with the 0.41-m 'PROMPT 4' telescope located at Cerro Tololo. in a stack of twenty 40-s images taken between 2008 Dec. 26.33 and 2009 Jun. magnitudes measured through a 10" aperture: V = 11.9, R = 11.7, I = 11.5.
aperture magnitudes for comet 29P supplied by Trigo-Rodriguez: 2009 Dec.
20.04, R = 16.4 (Trigo-Rodriguez, Montseny, Spain, 0.18-m reflector); Dec.
Oct. 30.80, 13.2; Nov. 30.75, 12.8; Dec. 30.66, 12.0; 2010 Jan. 11.68, 13.6. R.A. = 12h15m41s.06, Decl. = +36d20'02".9 (equinox 2000.0), which is 20"
figures 41s.07 +/- 0s.01, 02".4 +/- 0".2 for 2010U. on the Central Bureau's unconfirmed-objects webpage, M. Nissinen and V.-P.
Observatory site, yielding mag 16.2 on Feb. 7.419 and mag 16.0 on Feb.
his image at website URL http://space.geocities.jp/yusastar/PSN100207.htm. Hobby-Eberly Telescope (+ Marcario Low-Resolution Spectrograph) by M.
with a library of supernova spectra using the "Supernova Identification"
with the type-Ia event 1991bg at approximately 54 days post-maximum light. match the type-IIP event 2006bp at 65 days post-maximum. 2009 Dec. 16.068 (limiting mag 18.7), or on his earlier images. J. 20.5) and 1995 Nov. 22 (limiting blue mag about 21.0). supernovae 1994I and 2004aw at a few days before maximum light. this position on his previous image of the same field taken on 2009 Dec.
27.81 (limiting mag about 18.5) or on Palomar Sky Survey red and blue plates. Further to CBET 2130, X. Parisky, S. B. Cenko, W. Li, and A. V.
infrared, red, and blue plates. 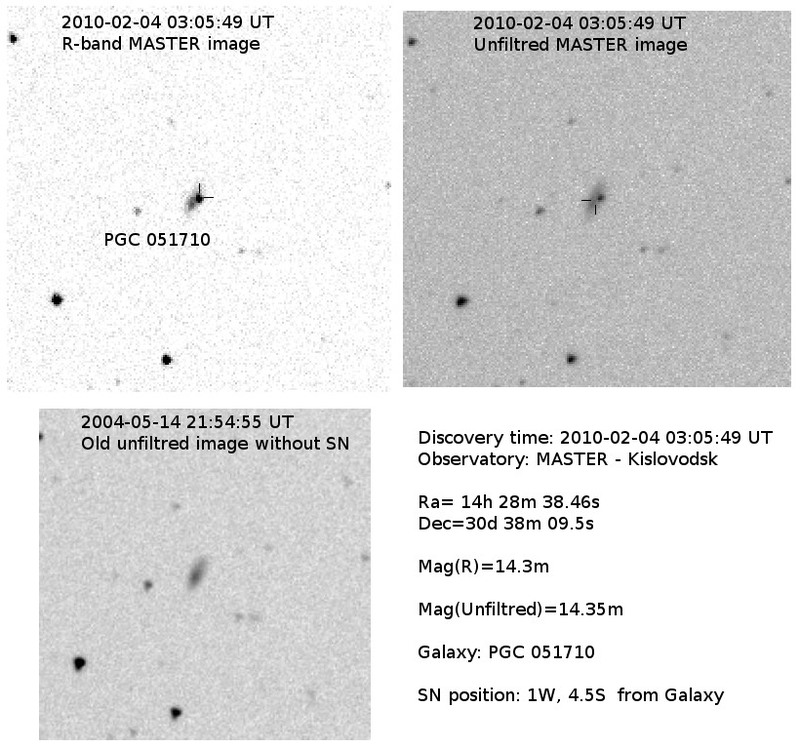 frames taken by Prieto and Khan with the 2.4-m Hiltner telescope on Jan.
the 2.6-m Nordic Optical Telescope during IAA time on Jan. 17.218. GAlaxieS) survey team, with the 2.5-m Isaac Newton Telescope (+ WFC) on Feb.
(equinox 2000.0), which is 10".7 east and 24".7 south of the center of M81. as faint as Sloan r' = 23.0, R = 23.1, V = 23.4, and H-alpha = 21.3. Hornoch et al. also report additional magnitudes for M81N 2010-01a (cf. which is 11" east and 7" south of the core of the type-Sbc galaxy NGC 692. +/- 4"): R.A. = 17h26m32s.19, Decl. = -28d49'36".3 (equinox 2000.0). http://www.k-itagaki.jp/images/pn-oph.jpg. Nakano further notes that K.
exposures (limiting mag 16.5) taken on Feb. 19.825. After posting on the Central Bureau's unconfirmed-objects webpage, R.
frames) is visible via the following website URL: http://tinyurl.com/yfol3nu. that nothing is visible at this position on Digitized Sky Survey plates. Nothing is visible at this position on a KAIT image from 2009 Sept. 9.15 UT. those of supernovae 1997B and 1997ei at 25 days after maximum. 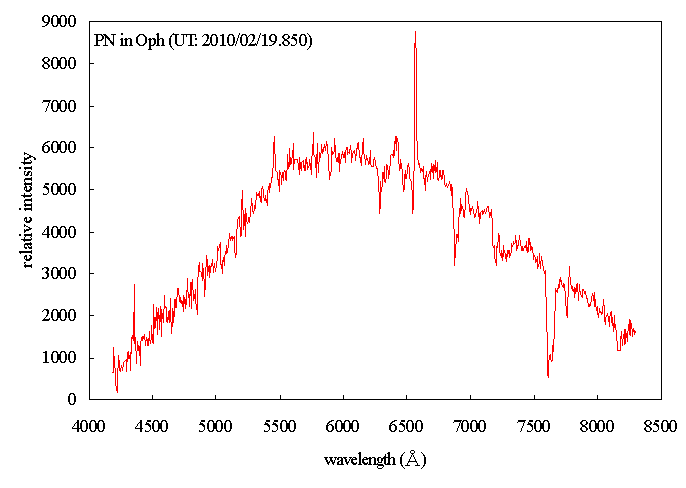 spectrum of the presumed nova announced on CBET 2176, obtained on Feb.
about 700 km/s, and the equivalent width of Na I D lines is about 0.4 nm. Digitized Sky Survey plate is posted at website URL http://bit.ly/b7JFXt. Processing Laboratory, Universidad de Valencia; N. Morales, J. L. Ortiz, J.
apparent nova of mag 15.8 in ultraviolet SWIFT images taken of M31 on Jan.
0h42m42s.81, Decl. = +41d16'14".7 (equinox 2000.0), which is 17" west and 5"
frames: Jan. 2.799, [19.9 (CCD frame taken during software tests by P.
Morales, Ortiz, Gorosabel, and Jelinek). shows a blue continuum with Balmer lines typical of a young type-II supernova. z = 0.046 was estimated from the narrow Balmer lines of the host galaxy.